These pictures were taken right before it started to snow again. The weather actually warmed up for a couple of days, still below freezing but not horribly cold. This weekend will definitely be spent indoors. Babies hate being cold and since they can't regulate their temperature it isn't fair to take them out often during this time of year. That's why I'm excited for Spring, I will be able take Zaden on walks and to the park. Most of the items I'm wearing in this outfit post were gifted to me for Christmas. I love this cardigan my sister gave me, it's nice and flowy and also works as a nursing cover. I was in need of a plain white cardigan! My sisters dear friend Eviana gifted me this gorgeous chunky jeweled necklace. I think it's so pretty and I thought this outfit could use a little bling other than my wedding ring. Last but not least Dani gifted me these gorgeous red pumps! I can admit that I was a little hesitant to wear them at first in fear that they would be uncomfortable and hard to walk in, but boy was I wrong! I absolutely love them and can't wait to wear them again this weekend when Daryl and I go out to the movies. oh my gosh its seriously been so cold. now its all snowy again i hate it. i can't wit for spring either! I love elephants, so obviously i'm obsessed with your shirt! Love the necklace and I love the shoes! They are so cute! obssesed with this outfit! saw it on ur instagram..those shoes and necklace are perfect!!! I really like your shirt. It looks super nice. where do you live to always have snow!? lol i miss it. cute heels. you look great and i am so so jealous of your snow and top! elephants are my most favorite animal! Super cute! I think that tshirt is amazing. Happy Friday! You totally scored! I love it when I get wearable gifts;) Yesterday I went thrifting to find something cute for me, and I found some great books instead...definitely need to do that more often!! I just read your comment and so I felt a bit proud of myself. ha ha So jealous you have snow!! Such cuteness C! Love those shoes! Wow! ANd you get to go to a movie this weekend!?? Lucky! Have fun! I'm obsessed with your elephant shirt!! And you always have such cute jewelry, I am so jealous!! 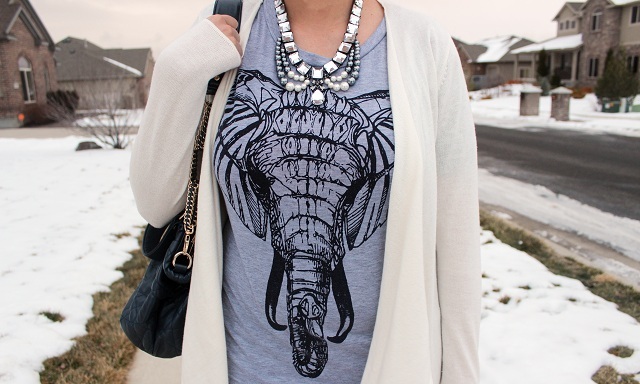 love the elephant shirt and the necklace! love how you use red shoes to complement them! Those red shoes are so fab! I love the bright pop of red! 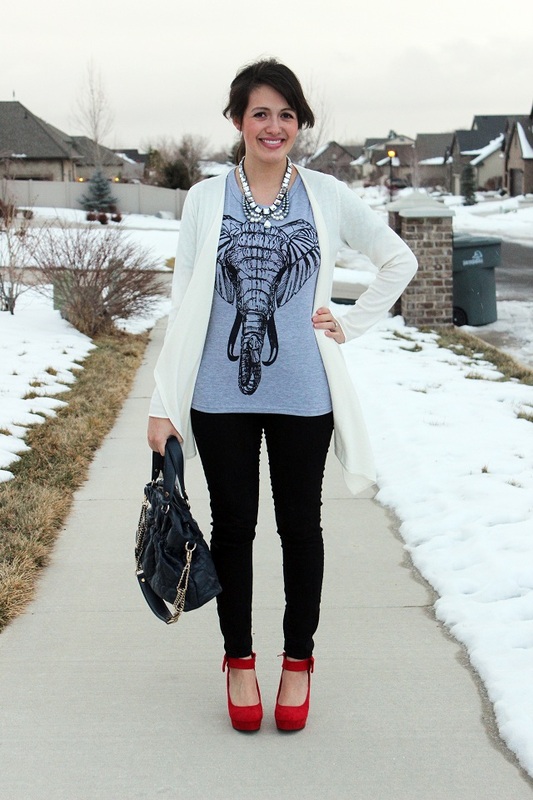 I love the elephant graphic on your shirt! And your pumps are gorgeous! Oh I love the elephant print! That is so cool! Love this outfit, I need that shirt and those heels! Those shoes are to die for!! Love them. 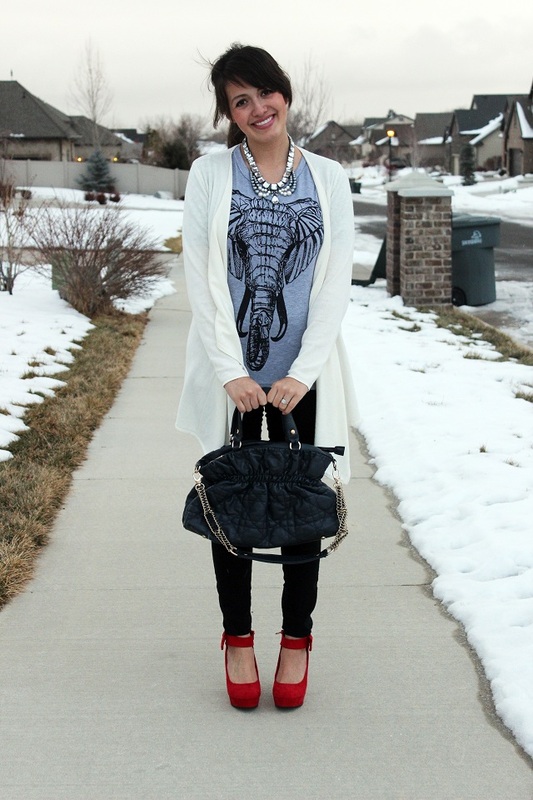 That elephant shirt is darling too and I love the cardi with it. I'll be spending the weekend indoors too. Sick of this awful bitter weather. looooove those shoes!!!!! oh my gosh they are beautiful! Wow-- merry Christmas to YOU! Looking lovely, sweet lady! Love those pumps! I love how your red shoes provided a pop of colour to your whole outfit ensemble. You look so super pretty in this outfit. And your shoes are breathtaking! Love the pop of color in the red shoes! Love those bold shoes and statement necklace. It does look super cold out there! that elephant shirt is so fun! and you look gorgeous as always, cecilia! Love the shoes! Great pop of color and the bows are pretty and feminine.